You've tasted our food! You've seen our dances! Now learn about our Faith! We take pride in the ethnic heritage of our community, and it is an honor to be able to share our many traditions. Yet as meaningful as these traditions are to us, our church is built upon something infinitely more important than food or dance. What ultimately binds us together is not our ethnic identity, but the unity we share in our Lord and Savior, Jesus Christ. As Saint Paul writes: "There is neither Jew nor Greek, there is neither slave nor free, there is neither male nor female; for you are all one in Christ Jesus" (Galatians 3:28). Thus, there is no need for one to be ethnically Greek to be a member of our Greek Orthodox Church. In fact, our community has members from many ethnic backgrounds, as well as many former Catholics and Protestants who have been attracted by the ancient Christian faith that has been preserved for 2000 years in the Orthodox Church. 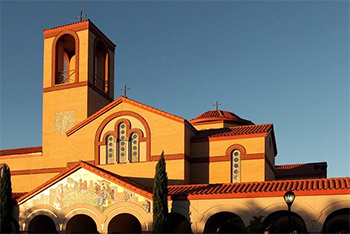 We invite you to take a tour of our Church and learn more about the Orthodox Faith. The church will be open according to the schedule below for both self-guided and guided tours. There will also be special programs throughout each day which will highlight the musical tradition of the Greek Orthodox worship. Finally, we would also like to invite you to join us for one of our worship services either during the festival or on in the future! For more information about the Eastern Orthodox Church, check out your Festival Program.